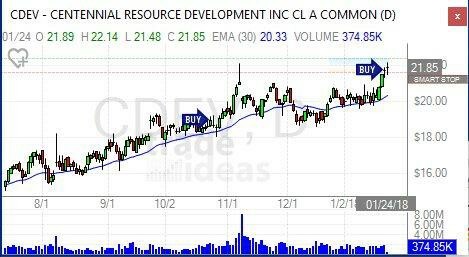 CDEV caught the attention of HOLLY — Trade Ideas’ AI Engine — this week as the stock attempts to break above all-time highs set in early November. HOLLY has a good track record with this stock, first alerting subscribers to an entry on October 24th when the stock was trading just below $19. Now north of $21, it appears catalysts are once again arriving in the stock that may drive it past those highs set in early November after the initial drive. The model HOLLY Alpha Long Swing Trade portfolio will be adding this stock to it’s portfolio at tomorrow’s opening print (January 25, 2018) and we’ll keep this stock in the portfolio until such time that it retraces a full 20% from the high print we see during our hold time. To employ HOLLY in your service to capture Alpha in your swing trading or day trading portfolio, please visit Trade Ideas to learn more.